Fine glass and crystal have been produced in the Bohemia region of the Czech Republic, since the 13th century. 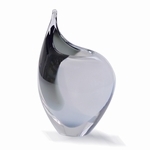 These graceful vases and elegant birds are handmade in this region, as are the glass eggs. They all have strong shapes and flowing colors. 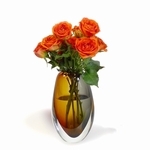 Beautifully made, they can create striking displays for a table or shelf. Memorable wedding gifts, they're also perfect for a wedding anniversary... Modern gift lists suggest crystal/glass for the 3rd anniversary. Traditional gift lists suggest crystal for the 15th.